54446-PK is rated 2.4 out of 5 by 8. Rated 1 out of 5 by Rokal from Nice idea but poor quality I have owned this shower head for about a year. Like other reviewers have mentioned, the button stopped working and rendered the unit useless. I expected better quality from the Delta brand, especially for this price. Rated 3 out of 5 by Tracy72 from Good idea, poor button function I loved this showerhead for the few weeks it worked properly. But then after only a few weeks the button to change the water spray stopped working. So we are stuck in between sprays which is a total bummer. I've tried to fiddle with it to get it to work again to no avail. I have also tried googling a fix for this problem and have found nothing. Other than that it's great. I love the temp display and how the color changes to let you know if it's too hot or too cold or not. Just wish I could fix the button. Rated 5 out of 5 by the Jockmon from The best hand held shower head yet. Loved my shower head with temperature indicator lit up with different colors as the temp changes. But after a couple of weeks the temperature indicator no longer comes on or not until the end of the shower if at all. Rated 3 out of 5 by ZiroOpinion from I love my Delta shower head, but... 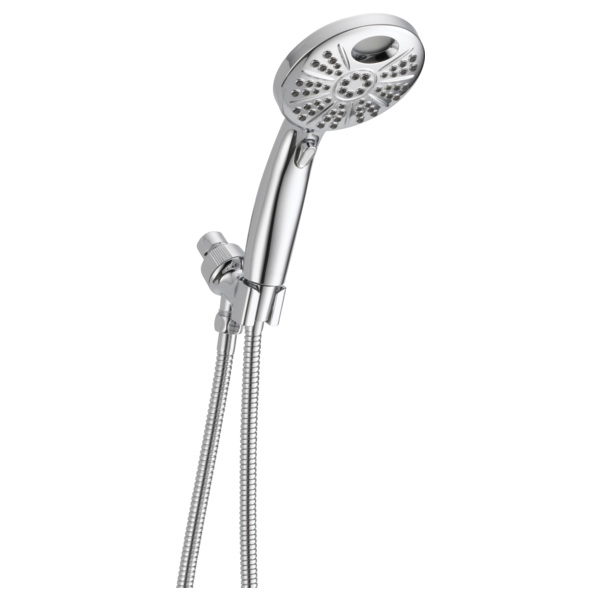 I love my Delta Temp2o shower head and it saves time with setting the shower to my optimal temperature. Unfortunately, I have had my shower head for a little over a year now, and unfortunately the blue LED in the shower head stopped working so the display is always red. This isn't terrible since I can just look at the temperature and know that it is set to properly, but the color issue has caused a bit of confusion for my kids. Rated 1 out of 5 by TAR1 from Great for a couple of weeks unit was great for a few weeks then the selector button stopped working. Rated 4 out of 5 by kmduboff from Cool Feature My 14 year old son loves the color coding so he can get in at the right temperature. The only thing I have noticed at this point is a slight whistle from the unit if the water pressure fluctuates. Outside of that, worth the money. Rated 1 out of 5 by Tundrageek from Seems like a neat idea but the button stopped working Had the shower for just over a week and the spray selector button stopped working after day 2. We've been able to limp along for the rest of the week by banging the other side of the handle on top of the button to get it to release, but that method has worked less successfully each day. When it does work, water spray and patterns are nice. Rated 1 out of 5 by gajep71 from Absolute Junk The spray selector stopped working 5-6 weeks after install, temp display started malfunctioning a few weeks later. Can this switch between Celsius &amp; Fahrenheit?